A new, stable artificial photosynthesis device doubles the efficiency of harnessing sunlight to break apart both fresh and salt water, generating hydrogen that can then be used in fuel cells. The device could also be reconfigured to turn carbon dioxide back into fuel. Hydrogen is the cleanest-burning fuel, with water as its only emission. But hydrogen production is not always environmentally friendly. Conventional methods require natural gas or electrical power. The method advanced by the new device, called direct solar water splitting, only uses water and light from the sun. "If we can directly store solar energy as a chemical fuel, like what nature does with photosynthesis, we could solve a fundamental challenge of renewable energy," said Zetian Mi, a professor of electrical and computer engineering at the University of Michigan who led the research while at McGill University in Montreal. Faqrul Alam Chowdhury, a doctoral student in electrical and computer engineering at McGill, said the problem with solar cells is that they cannot store electricity without batteries, which have a high overall cost and limited life. The device is made from the same widely used materials as solar cells and other electronics, including silicon and gallium nitride (often found in LEDs). With an industry-ready design that operates with just sunlight and seawater, the device paves the way for large-scale production of clean hydrogen fuel. Previous direct solar water splitters have achieved a little more than 1 percent stable solar-to-hydrogen efficiency in fresh or saltwater. Other approaches suffer from the use of costly, inefficient or unstable materials, such as titanium dioxide, that also might involve adding highly acidic solutions to reach higher efficiencies. Mi and his team, however, achieved more than 3 percent solar-to-hydrogen efficiency. To reach this stable efficiency, the team built a nano-sized cityscape of gallium nitride towers that generated an electric field. The gallium nitride turns light, or photons, into mobile electrons and positively charged vacancies called holes. These free charges split water molecules into hydrogen and oxygen. 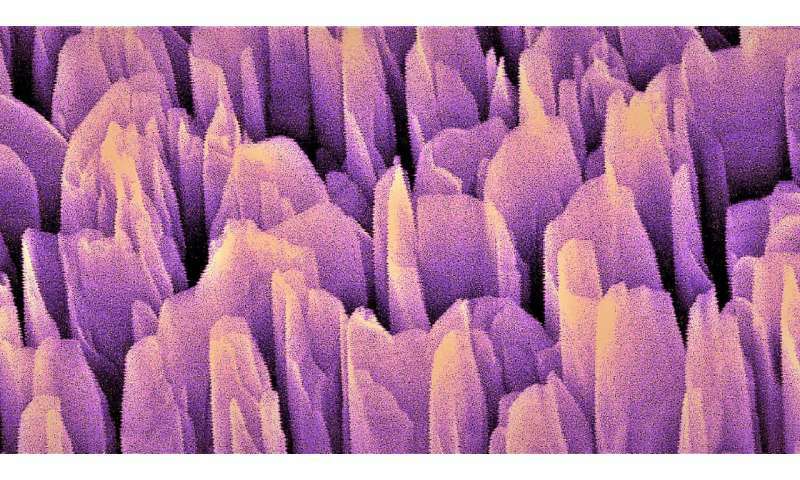 "When this specially engineered wafer is hit by photons, the electric field helps separate photogenerated electrons and holes to drive the production of hydrogen and oxygen molecules efficiently," Chowdhury said. At present, the silicon backing of the chip does not contribute to its function, but it could be doing more. The next step may be to use the silicon to help capture light and funnel charge carriers to the gallium nitride towers. "Although the 3 percent efficiency might seem low, when put in the context of the 40 years of research on this process, it's actually a big breakthrough," Mi said. "Natural photosynthesis, depending how you calculate it, has an efficiency of about 0.6 percent." He adds that 5 percent efficiency is the threshold for commercialization, but his team is aiming for 20 or 30 percent efficiency. "That's the truly exciting part," Mi said. The device is documented in the study, "A photochemical diode artificial photosynthesis system for unassisted high efficiency overall pure water splitting," published in Nature Communications. Along with Mi and Chowdhury, co-authors include Michel Trudeau of the Center of Excellence in Transportation Electrification and Energy Storage, Hydro-Québec, and Hong Guo of McGill University. It is a good thing when people focus on technology that uses what is above ground energy sources like hydrogen which is limitless instead of what is below ground which pollutes and is finite, I cannot wait until we can use hydrogen by pouring water into our tanks and utilizing the hydrogen directly and do not have to worry about storing the energy in batteries like with fuel cells. I am thinking about the redistribution of water molecules around the globe. Any takers. @neiorah, why would you want to convert water into hydrogen then burn hydrogen in a fuel cell then run on that electricity, when you can just use solar cells and get the electricity in one fewer step with better yield? Incomplete economic analysis - you first have to clean the inputs - water or CO2. What isn't said - the water input would have to be distilled - less mineral fouling disrupt the entire process. Distilling and filtering input water and CO2 changes the energy efficiency economy of this entire process. CO2 to combustible fuel may be more interesting, but only slows anthropogenic CO2 generation rather than reducing it.